So a lot of parts to this one and some assembly required. The body is white maple and the hole was painted with black craft paint. The sides and back have a one step stain/poly coating. The rest is a cut down screw filed flat in the back and glued to the body. 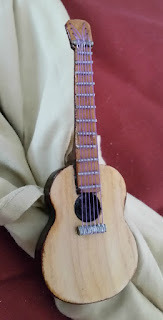 The neck is red maple and the frets are small pieces of wire glued to the neck. Once the neck and body were glued together, I gave it a couple of coats of poly. Once that was dry I "strung" the guitar using thread and super glue to keep the strings taught.